Years back when I first came across the term squat, frankly I failed to understand it. Well if you just want to know the mathematical formula and calculate the squat, it is no rocket science. 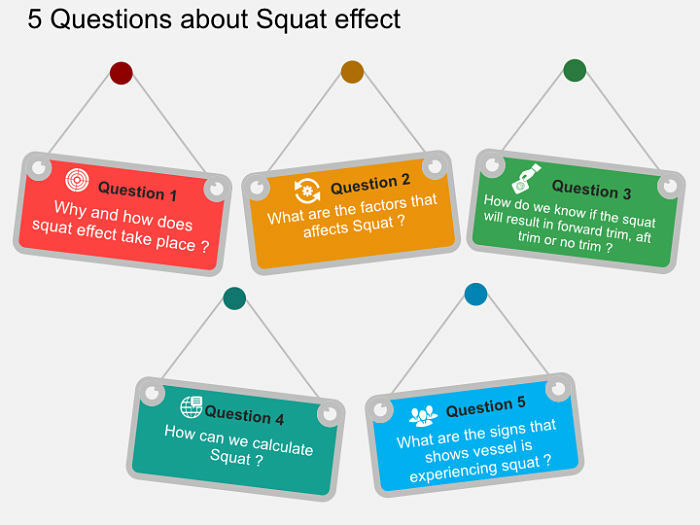 But to answer questions like “Why do squat effect take place” may not be easy to understand. Are you too in the same boat ? 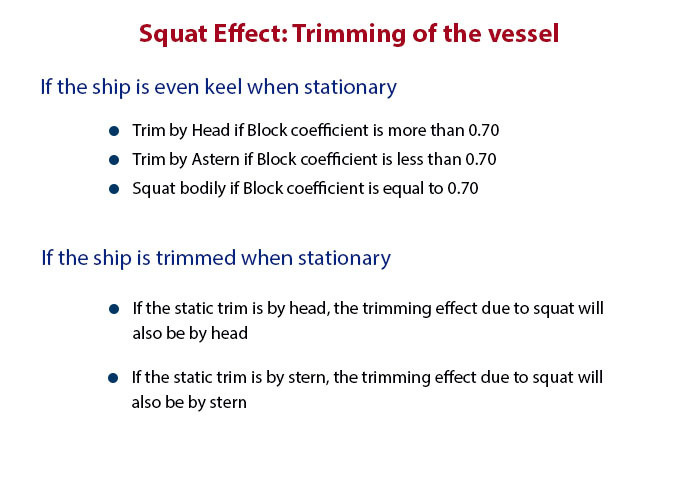 Most of us know that Squat is the decrease in ship’s under keel clearance due to vessel’s movement in the shallow water. And it is not a theoretical thing, it is a real thing. Incident of sinking of RO-RO vessel “Herald of free enterprise” was the result of squat. But squat is not always bad. In 2010, passenger vessel “Oasis of the sea” used the squat to its advantage. It allowed squat to reduce its air draft. This helped the vessel to safely pass under a bridge, which otherwise was not possible. Incidents like these show how important the knowledge of squat is. But there are many questions related to squat, answers to which are sometimes difficult to find. In this post I will try to answer five of these questions related to squat that mariners usually ask or enquire about. Question 1: Why and how does squat effect take place ? The ships float in water because of one simple reason. There is no net force acting on the ship. Now it is not that there are no forces acting on the ship. But all these forces are equal and opposite in nature. Two of these forces that act in opposite directions are gravitation force and buoyancy. Force of gravity like to sink the ship and force of buoyancy likes to make it float. Force of gravity continue to sink the vessel until force of buoyancy becomes equal to force of gravity. Even when we add a weight (cargo) on a floating ship, the gravitation force increases. This will cause the ship to sink up to a point when force of buoyancy (that increases as per the Archimedes principle) becomes equal to the gravitation force. If you wish to read more about Archimedes principle, you can do so by clicking here, here or here. The point I am trying to make here is that any increase or decrease in a force on or around ship will affect the ship in a way that depends upon the direction of force. 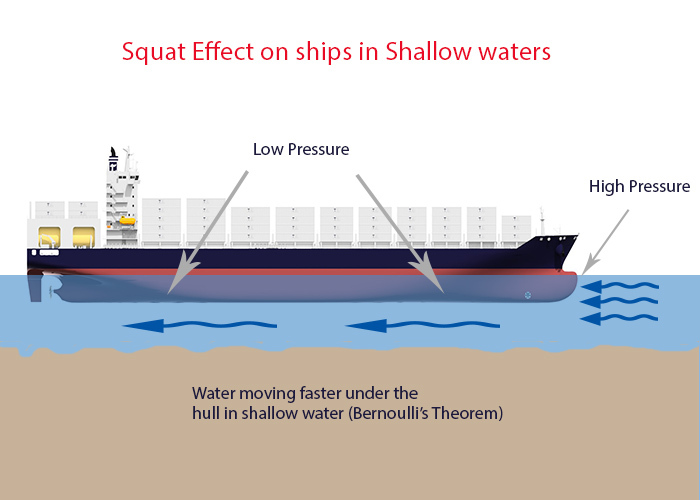 Squat is the decrease in ship’s under keep clearance when it moves in shallow water because of low pressure created under the ship. Now the question is why do we have low pressure under the ship when it is moving in shallow waters. The answer lies in Bernoulli’s theorem. If you are OK with reading little bit of physics, you can read about the Bernoulli’s theorem by clicking here or here. As per Bernoulli’s theorem, in a flowing liquid if the flow velocity increases, the pressure in the region would decrease. Above conclusion is drawn from the Bernoulli’s law of conservation of mass in a flowing liquid. As per Bernoulli’s theorem, the mass of flowing liquid in per unit area will always be same. Now have you tried to run fast and felt air resistance acting on your chest ? You feel some pressure on your chest. But do you feel similar pressure on your back ? I am sure your answer is No. You feel this pressure on your chest because your chest is trying to replace the air as you move (or run) forward. The air so replaced by you fills the vacuum you created by leaving your earlier position. In the same way, when a ship moves forward it pushes the water forward. The water all around must flow under and around the hull to replace the volume of water pushed by the bow. In open sea there is no problem for the water to flow under the hull. But in shallow waters, this flow is restricted. This results in higher flow velocity of water passing under the hull. And there is decrease in pressure because of high velocity of water (as per Bernoulli’s theorem). Now as the pressure at the bottom of the ship decrease, ship need to react in some manner to compensate that. 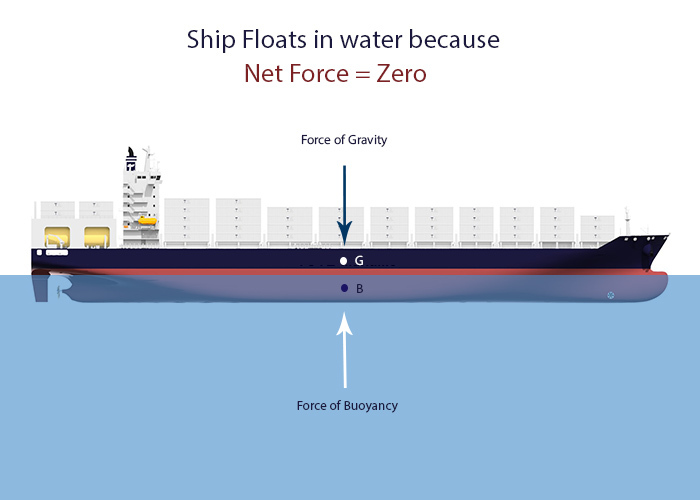 Remember we said, ship’s float because net force acting on the ship is zero. This drop in pressure is compensated by the sinkage of the vessel as the direction of this force (low pressure) is downwards. But will this sinkage be bodily, by stern or by bow ? We will discuss it later. Question 2: What are the factors that affects Squat ? Now that we know the reason behind squat effect, let’s see what factors affects squat. As we know the squat is caused by the low pressure that is developed under a ship in shallow water. With more and more speed of the vessel, the squat will increase. This is because with more speed, the vessel will push more water forward and more water is required to fill that void. This will cause more drop in pressure under the hull and vessel need to sink more to compensate for that drop in pressure. But we need to understand that the speed here is “speed through water” and not “speed over ground”. Why, you may ask ? Consider a ship moving at 6 Knots GPS speed with 6 knots current from astern. Is the ship pushing any water forward ? No it isn’t because the water is flowing with the ship. In fact in this case ship will not be using engine as the ship will be moving with the current. Will there be any squat in this case ? No there will not be because as the ship is not pushing any water forward, no water is required to pass under the hull of ship. So the squat in this case will be zero because the ship’s speed through water is zero. This is even when the ship is having a speed over ground (GPS speed) of 6 knots. 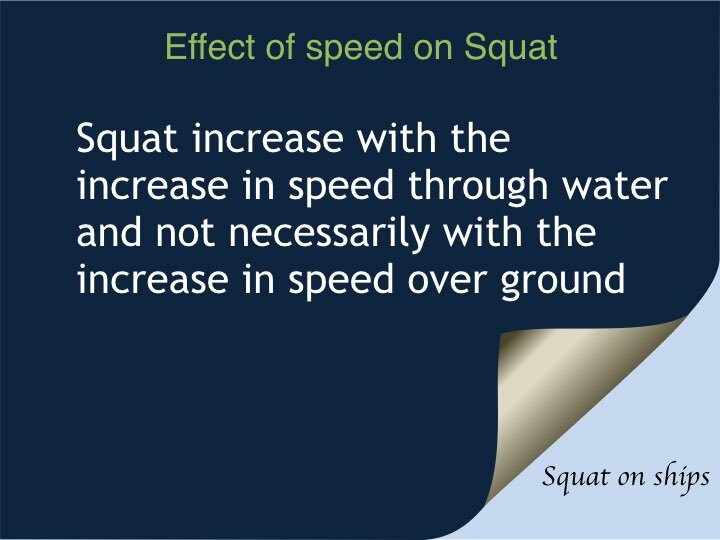 So we can say that squat depends upon the speed through water. This is also the reason that vessel can experience squat while alongside in a river with strong current. 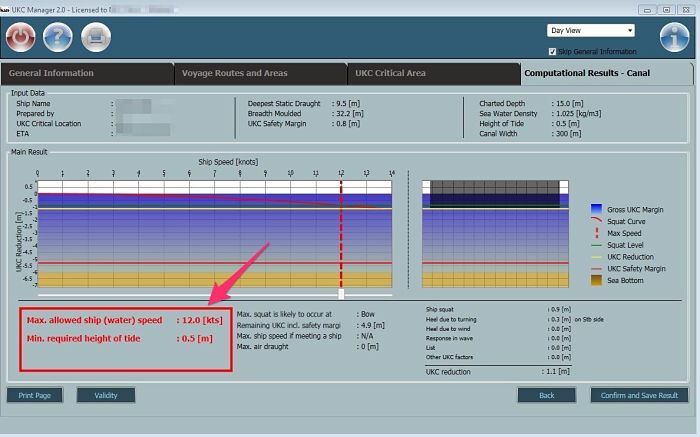 In this case vessel’s speed over ground is zero but speed through water is equal to the the river current. I am sure you already know what block coefficient of the vessel is. But I will refresh this for those who might need it. Block coefficient is the ratio of vessel’s underwater volume (Displacement) to the volume of a box that this could fit in. So for a box shaper vessel, the block coefficient will be 1. But how does block coefficient of a vessel affect Squat ? Again it all depends upon how much water a moving ship pushes forward. Let me ask a question. Which ship will push more water while moving. A box shaped vessel or a vessel like this in the picture below. I am assuming that you have got it right. Yes, a box shaped vessel will push more water and hence will have more squat compared to the ship in the photo above provided all other conditions are same. So more the block coefficient of the vessel, more will be the squat. Canals and narrow channels creates a different scenario. In a canal, Apart from having shallow water beneath, even the sideways water flow is restricted. This creates additional low pressure which affects the squat. But how do we know if the blockage factor exists or not. 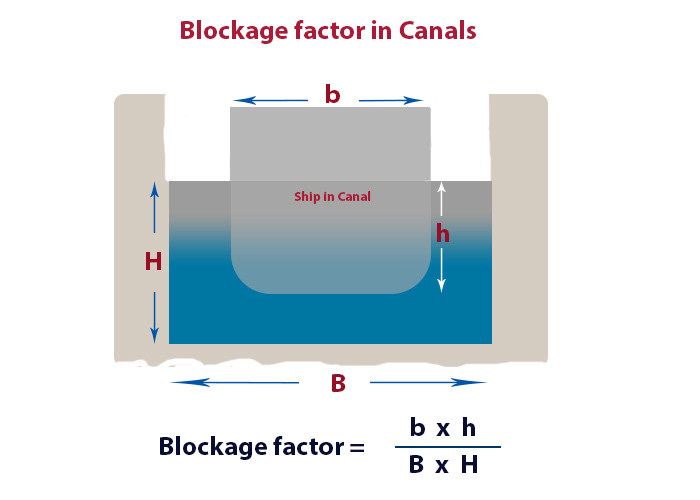 Blockage factor is a ratio of ship’s immersed cross section to the cross section of water within the canal. Blockage factor of less than 0.100 represents open sea like conditions and hence no blockage factor. Blockage factor of 0.265 represents narrow channel. Question 3: How do we know if the squat will result in forward trim, aft trim or no trim ? As we discussed, in shallow depths, the water tries to fill the void created by moving ship. 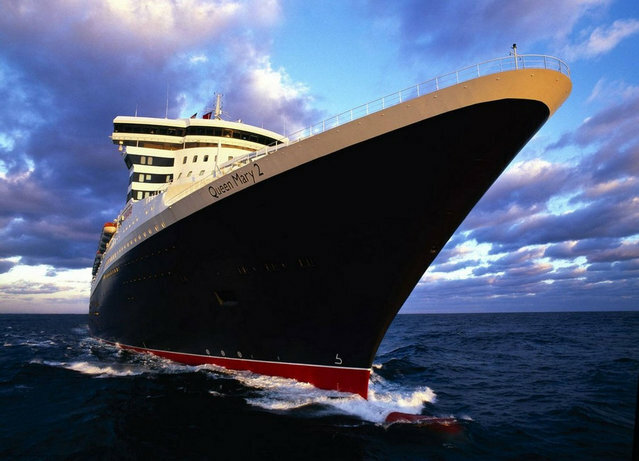 For the fine-form ships like Queen Mary 2, the bow of the ship will not obstruct the water flow as much as the mid and aft section of the ship. This is because of the shape of the bow. In this case the effective low pressure will be aft of the midship. This will cause the stern to sink more than the bow and will result in trimming aft because of squat. With full-form ships like super-tankers, it is other way around. On these ships bow shape is what we call full-form. Because of which bow obstruct considerable amount of water flow. The resultant low pressure created by the obstruction is forward of the midship and these vessel squat will occur more at the bow. This will result in trimming forward because of squat on these vessels. The tendency of the bow to obstruct the water flow is related to the block coefficient of the vessel. 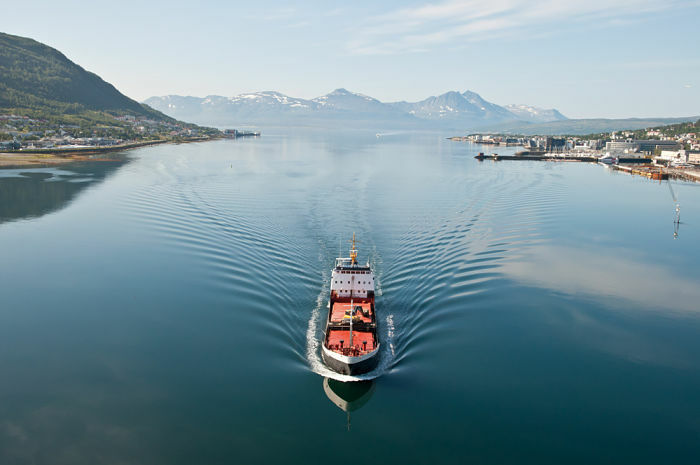 Block coefficient of the vessel also defines if the vessel will squat bodily, by stern or by bow. By various calculations, shipping scholars have got a defining value (0.7) of block coefficient. If the block coefficient is 0.7, the vessel will squat bodily. 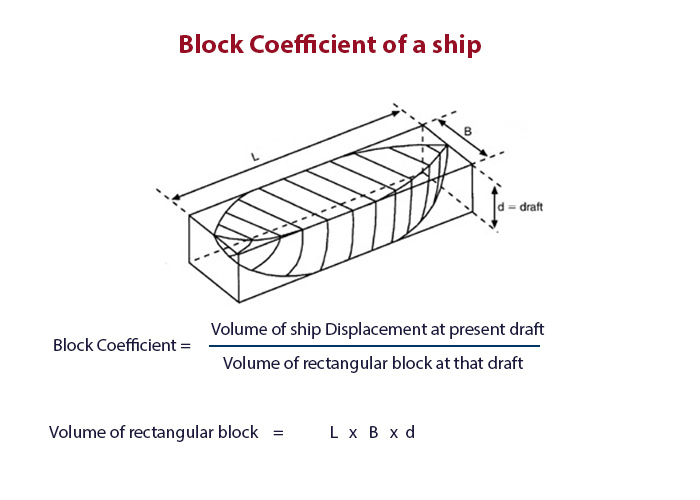 If the block coefficient is less than 0.7, the vessel will squat by stern. Finally if the block coefficient is more than 0.7, the vessel will squat by bow. Dr Barrass has done extensive research on the topic of squat. And as per him, above rule will only be applicable when the ship is at even keel in static position. As per him, if the vessel is trimmed by stern in static position, the maximum squat will be towards stern. And if the vessel is trimmed by bow, the maximum squat will be towards bow. Question 4: How can we calculate Squat ? This is most important question. How can we calculate squat ? There are two ways to know how much squat you can expect. One with the help of a software and second by manual calculation. 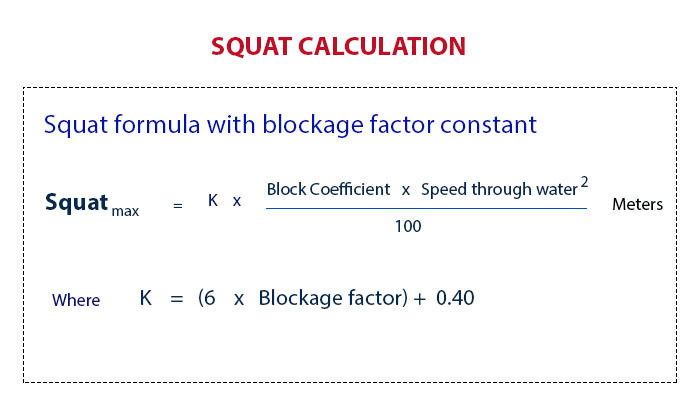 There are number of formulas to calculate squat. 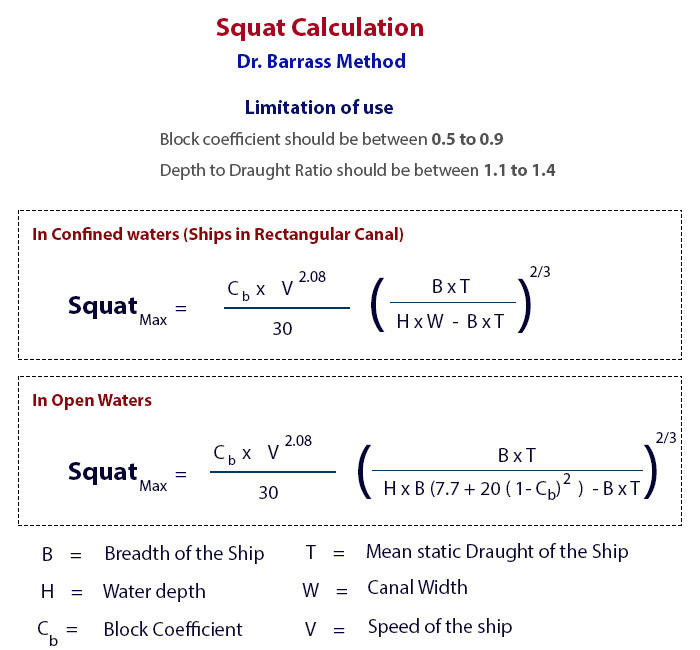 But Dr Barrass’s formula is widely used for calculating squat. Dr Barrass’s formula has several version ranging from the complex formula to the simpler ones. Have a look at the complex one. This formula has a simpler version which takes into account blockage factor. And more simpler formula and which is used by most of the navigators is the most simplified version of Dr. Barrass’s formula. If you notice, the simplified formula above is derived by applying the blockage factor of open sea (0.100) and that of a canal (0.265). There are plenty of softwares available to calculate squat. 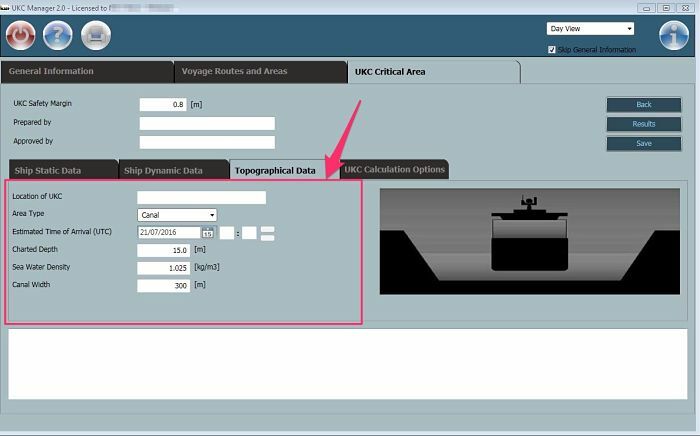 If you are using a software onboard for calculating squat, make sure that it has been provided by your shore office. Random softwares can give wrong values and as such can lead to mis-calculation of squat. 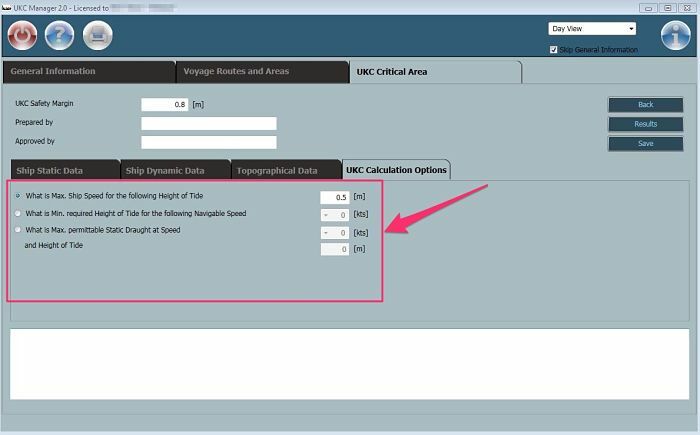 One of the authentic and good software for calculating squat is UKC manager. 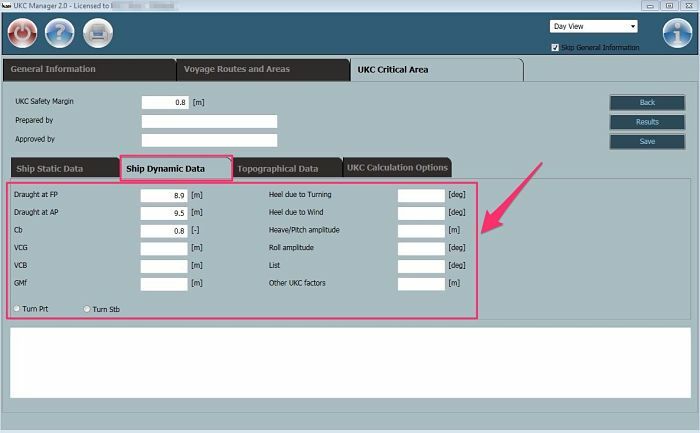 To calculate the squat on UKC manager software, open UKC manager and enter ship’s static data. Next enter ship’s dynamic data. In the dynamic data we just need to enter the values of draft at forward and aft perpendicular. Rest of the data is not required if you only need to have the value for squat. Next enter topographical data. If you are in doubt about sea type (open, restricted or canal), assume canal for being on safer side. 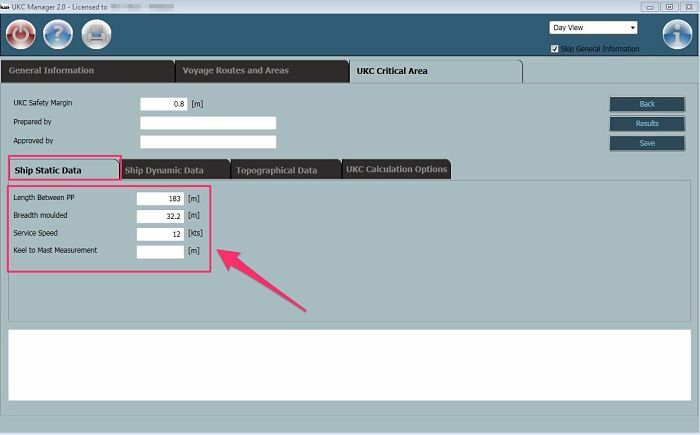 Now under the “UKC Calculation options” we can tell the software what we want to know ? Do we want to know the speed at which we can achieve required UKC ? Or do we want to know at what height of tide we can achieve the required UKC ? or do we want to know what should be our static draft to achieve the required UKC ? After choosing the required option, we can save and then click on results. 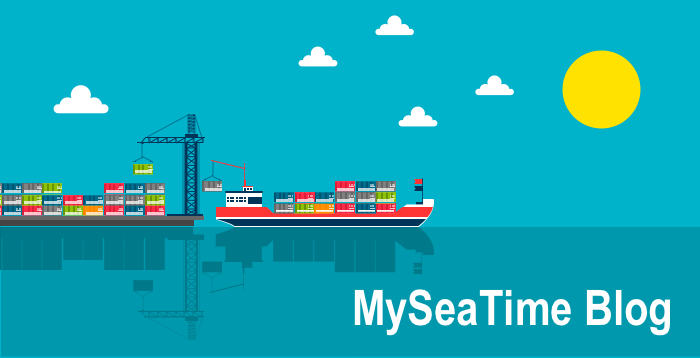 It will give the required results in complete detail which navigators can use for navigation. While we need to allow the squat while calculating the ship’s UKC in all stages of voyage, there are certain signs which can show that we have entered in the shallow waters. Knowledge of these signs can help the navigators to be more vigilant and keep an eye on the echo sounder. Presence of these signs is also a good time to re-confirm the squat with your calculation. For example if we expect our UKC to be 5 meters at this position and actual UKC is 4 meters, it would be better that we reduce our UKC by 1 meter in other stages of the voyage. We can then re-calculate if we are complying with UKC policy of the company. If not we can calculate at what speed we can comply and proceed at that speed. Engine rpm will decrease to compensate for the load on the engine. The speed of the ship will decrease. I have experienced with 0.7 meters UKC, vessel moving at full ahead only making 6 knots GPS speed. Squat is not a theoritical term. It is a real practical phenomenon experienced on ships moving in shallow waters. People have lost life because of ships that sank because of squat. 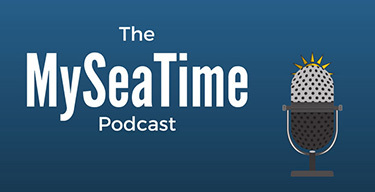 Ship owners have lost millions of dollars because of grounding of ships. It makes more and more important to have complete knowledge of squat and answer to these five questions can help in that. 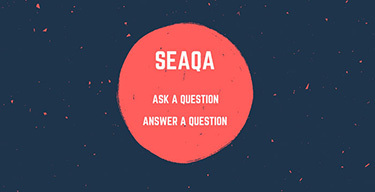 Do you know any other question related to squat that has gone unanswered ? Glad you liked it Vivek.. Very clearly explained sir.....Thank you. Glad you liked it Rakesh.. Thank you Capt Vijay for your kind words..
Just one question.. Can there be better explanation than that ? And the answer would be NO.. Thanks for your great efforts. Glad you liked it Rajdeep.. Thanks Capt Rajeev for one more marvel. Your dedication is commendable. Very clearly explained and nicely presented. Thank you Capt Sanjay for your kind words. People like you reading this is the fuel required for the hard work.. I am glad that it could be of some help to you Siddhant..
Good work on the blog Rajeev! This comment coming from you mean a lot to me Sir. Thanks a lot Sir. Glad you liked it Akshay.. Thank you for reading Selambharasan.. Thank you so much for your clear an compleate explanation . I would like to add, acordinly with some authors the squat will be at the head or stern with a ship trim by stern acordinly with the amount of the static trim by stern....static trim by stern leads to squat by stern ...it is no a fix rule.... Thank you. Glad you liked it Alejandro.. Yes you are right about the static trim..
Glad you liked it Gulbag.. Thank you very much for explaining this in a very simple yet precise way.Already forwarded it to my colleagues and cadets. Happy that you found it useful Subodh. Thank you so much for forwarding it. Dear Rajeev, this is a very good explanation of squat phenomenon. Thanks a lot. I will forward this to my friends. Glad you liked it Cem.. Thanks for sharing it with your friends.. I noted squat while alongside a berth on a river. We had calculated the expected draft before coming alongside and took visual draft readings, applied the salinity and the numbers were off. Then we applied the squat calculations due to the current and UKC and it worked out perfectly. It was a first for me. Yes Tim, you are right. Vessel will have squat while alongside a river berth because of river current. Great job....Keep the engines running full ahead since lot to achieve...Thanks and kind regards. Thank you for good job. Can you explain please how squat affect vessel’s stability? Is it because change of ships underwater volume, change of center of buoyancy, change to KM? Is the difference between KM figures of corresponding drafts is directly applicable for calculations? And other question, is the no any changes to drafts when vessel at deep sea? 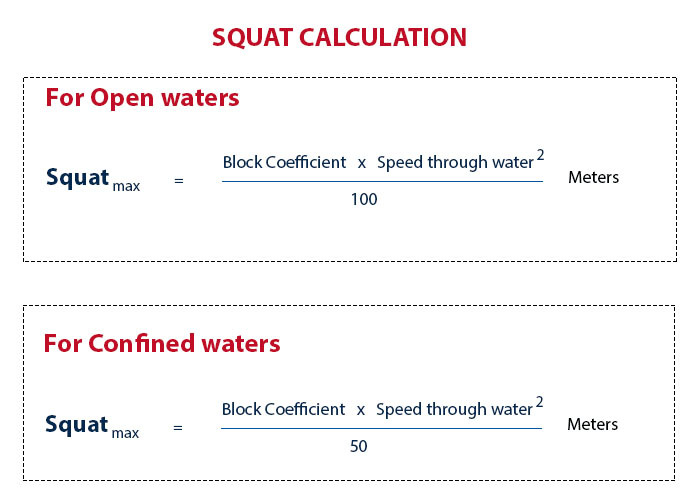 Yes, Squat will have some effect on stability as underwater volumes and so centre of buoyancy changes a bit. But it is not as easy as having and comparing stability of two conditions. In this case as there is no weight distribution change centre of gravity go the ship remains same. At Deep sea, the change in underwater clearance is negligible if any. Very clear explanation. Tomorrow is my Orals, and I'm confident about Squat now. Glad to hear that Raja.. Awesome explanation, although some of these softwares that we encounter on board as the one shown in the article have this ship dynamic data which need to be taken into account. (change of draft due to effect of wind, tide, sea, atmosphere pressure and so), i think we will all appreciate if you can write down and advise us how to calculate or where to find them exactly. From my experiance some colegues are putting some values there just not to leave it blank, but infact after this during vetting or PSC it is embarassing when they have to explain how did they came with these values. Thanks in advance. Nice and very neatly clearifi sir..
Glad you liked it Capt Bhattacharyya.. Very Well explained sir .. thank u so much.. for this beautiful knowledge. Glad you found it useful Shitanshu..
Glad it helped you Varun..
the ship will experience squat (and thus reduced UKC) in river ports with strong currents even when ship is moored. This is because the water is flowing under the ship's hull which will cause the reduced pressure. Thanks very much sir .. Indian needs people like you to produce better captains .. for industry . Comprehensive and simple to understand. Rajeev, I have now read through your 5 Questions and comments. I find some of my/your quoted formulae are now out of date. Do you wish conversation about this? My UK telephone number is OO44 1704 569 454. Best wishes. Bryan Barrass. Rajeev, Some of these formulae are out of date. Do you wish to have conversation about them? Best wishes. Bryan Barrass. My Telephone Number is 0044 1704 569 454.
as 50 confined water had breath restrictions ; as 100 open sea without breath restrictions , so is it explain why 50 and 100? Explained nicely . can you upload a squat table in ship we use . Very nice and clear with reasonable logic and examples make me happy. Superb sir. Thank you very much for the excellent explanation I am now fully aware of what is (Block Coefficient) and calculation of squat. God bless you sir. I have recently started following your blog and must say your explanations are very good about everything you write, appreciate your efforts. Please continue to share your Knowledge. Thank you very much sir. respect from Bangladesh. Same here too, thanks a lot. Very clear and simply explained ! Thanks Capt. Rajeev Jassal. I wonder if you have experienced the navigation in France La Rochelle/Gironde area where Chief Pilot says: ""Please note that BARRAS Calculation for UKC in Gironde and Garonne may NOT be used, several publication describes this type of navigation i.e. squat prediction in muddy navigation area, Ghent university 2010/ SOGREAH Navigation dans les chenaux envasés 1991"" ? Thanks in advance for your reply ! Thank you for your explanation, but still have one question: will be any effect of squat on depth more than 1000 meters, vessel VLGC 320 m , speed 16 knots, open ocean area? hello, can you tell me please where are these numbers (blockage factor 0.1 and 0.265) taken from? are there any conventional requirements? and what kind of water shall be deemed as confind waters, i read somewhere that breadth of water must be not more than 8.5 times ships beam so as to deem water area confined, but is just breadth enough? why not taking in account the depth of the water? I was preparing for my exams and this topic was quite difficult for me to understand. Thanks to you to made this topic crystal clear for me. Would a large thrust in reverses to stop the vessel cause a vessel to increase here draft?